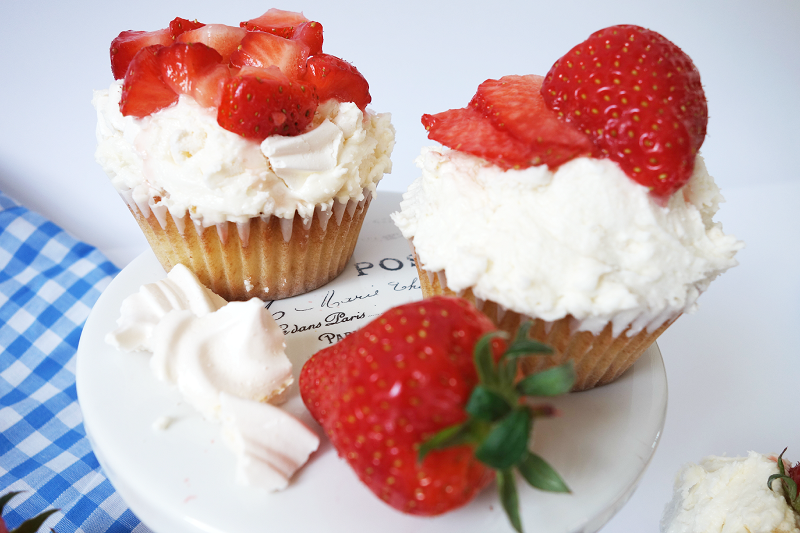 plus strawberries to decorate the tops of the cupcakes. Step One | Preheat oven to 190degrees/gas mark 5 and put cupcake cases into a tin. Step Two | Combine the butter, sugar, flour, baking powder and salt together on a low speed until it resembles fine breadcrumbs. Step Three | Mix the milk, vanilla essence and the egg in a separate jug, then add it slowly to the dry ingredients until it becomes a smooth batter. Spoon into the cupcake cases and bake for 18-20minutes until spongey and lightly golden on top. Step Four | Once the cupcakes are cool, hollow out a small space and put a teaspoon of strawberry jam in the centre (if required!). For the frosting, mix the icing sugar and butter together until fully incorporated then add the milk and vanilla essence and mix on a high speed until light and smooth. Step Five | Crumble up the meringue and add to the buttercream by hand, using a folding motion so they don’t break down too much. Apply to the cupcakes with a palette knife. Chop up or slice strawberry’s and place on the top. Crumble over some more meringue if desired. 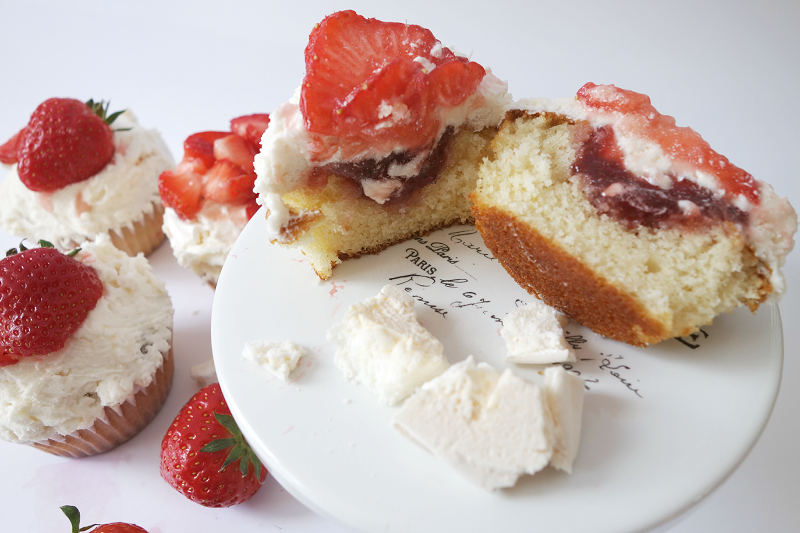 Serve straight away or place in the fridge so the icing hardens up slightly and the juice doesn’t run too much. 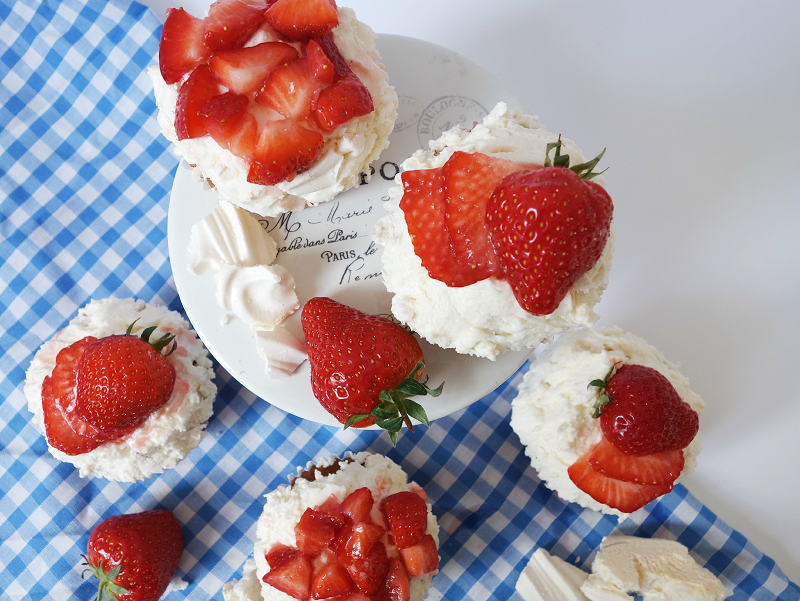 So they’re my take on eton mess strawberry cupcakes! 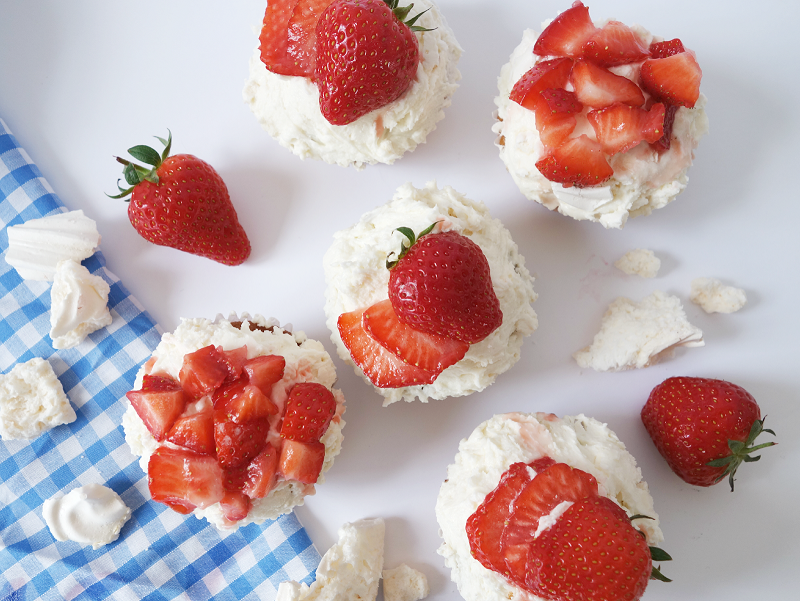 They’re really simple to make and are perfect for when the weather is a bit warmer. The cupcake recipe is a good, basic one to note down as it makes the lightest sponge and has never failed me yet. Hope you like it!